This page contains all the legal information about the website as required by relevant laws in Germany. This is not a contact page for questions about banking in Germany. In case you have questions about banking in Germany, check the contact us page. Make it a nightmare for a non-german speaker to find information about German bank account and compare them. As a foreigner myself, I realized that there is no information in English. After a few years in Germany and with a better understanding of the language and process I have created this website. This website is for information purposes and contains non-biased information about banking and finance in Germany. In the meantime, the information has been updated, the information on the website may have expired, please check with the website for the latest information. 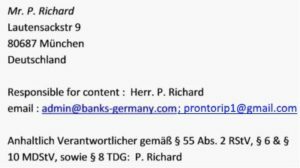 So, the information provided by the Banks, however, does not take responsibility in case of discrepancy, and the German language information should be considered as correct. No warning without previous contact! If the content or the presentation of these pages infringe third-party rights or statutory provisions, we ask for a message without cost note. We guarantee that the rightly disputed passages will be removed without any need for legal assistance. However, we will completely reject any costs incurred by you without prior contact and, if necessary, file a counterclaim for breach of the aforementioned provisions. Ich hoffe, es geht dir gut. Ich melde mich, um zu sehen, ob Sie redaktionelle Inhalte von externen Unternehmen akzeptieren. Wir arbeiten derzeit an einem Projekt, von dem wir glauben, dass es mit banks-germany.com gut funktionieren würde, und ich würde sehr gerne einen Artikel für Ihre Website bereitstellen. Wir bitten, dass unser Artikel nicht als gesponsert markiert, von admin, Gastbeitrag oder EditorialPR veröffentlicht wird. I am getting in touch to see if you accept editorial content from external companies. We are currently working on a project that we believe would work well with banks-germany.com and I would very much like to provide an article for your website. We ask our article not to be marked as sponsored, posted by admin, guest post or mention EditorialPR.